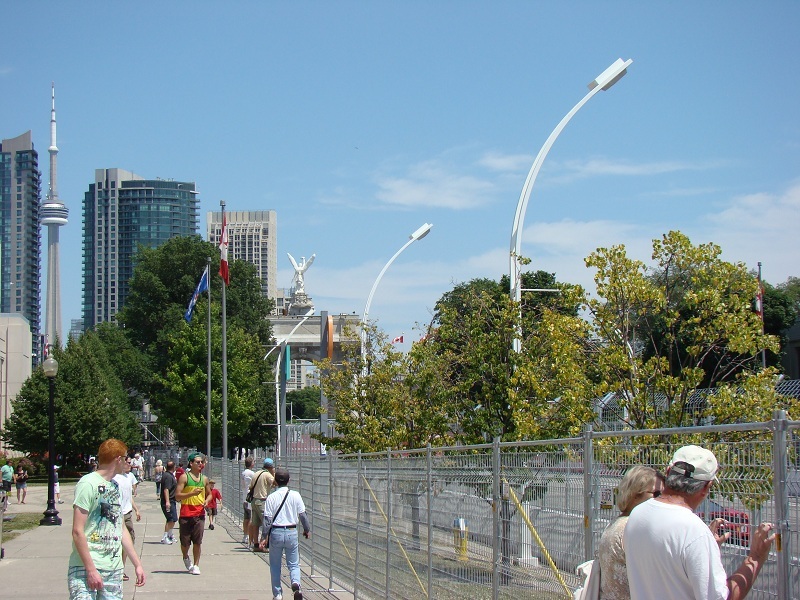 Around noontime, the red-hot exhausts of five racing series worth of vehicles heated the CNE grounds as the Honda Indy Toronto entered in full swing. It was also at this time in the sun has sufficiently baked the Canadian city. Embracing the heat of the new afternoon, the fifth and final form of motorsports given a crack at the road course was the NASCAR Canadian Tire Series. Of all the series that practiced on the Toronto street course, the fiberglass-bodied stock cars provided the most eventful session of the still-young weekend of racing. Kerry Micks' car stopping on track plus damage to the cars of Steven Matthews and 2010 NASCAR Canadian Tire Series champion DJ Kennington concluded the session. Based on the prestige and crowds attending the 2011 Honda Indy, the NASCAR Canadian Tires Series event on the Saturday was considered a major race. Drawing names like Jason Bowles and Canada's own Andrew Ranger away from action south of the 49th parallel, the preparation for the 100-mile stock car event. Attending the Honda Indy for so many years has given me a reliable natural compass to guide me to where I can expect to see action on and off the track. 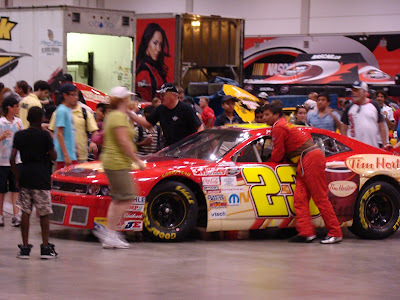 Following the NASCAR Canadian Tire Series practice, I planted myself within the paddock area of the stock car series. 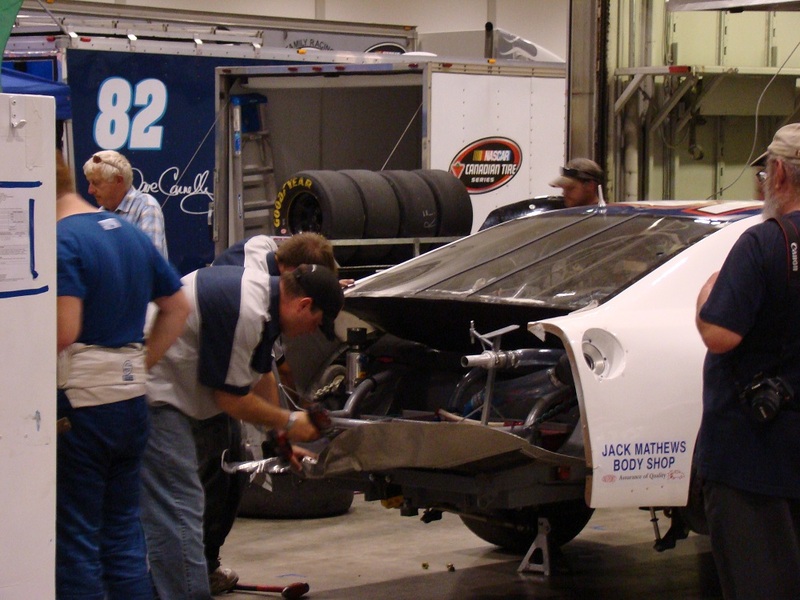 Inside Toronto's Direct Energy Centre, the stock car roared up to their small service areas behind their race haulers. With NASCAR Canadian Tire Series qualifying only 4 hours away, the #15 car crew of Steven Matthews and the #17 Castrol crew of DJ Kennington were quickly sent to work on restoring their race machines to peak performance. 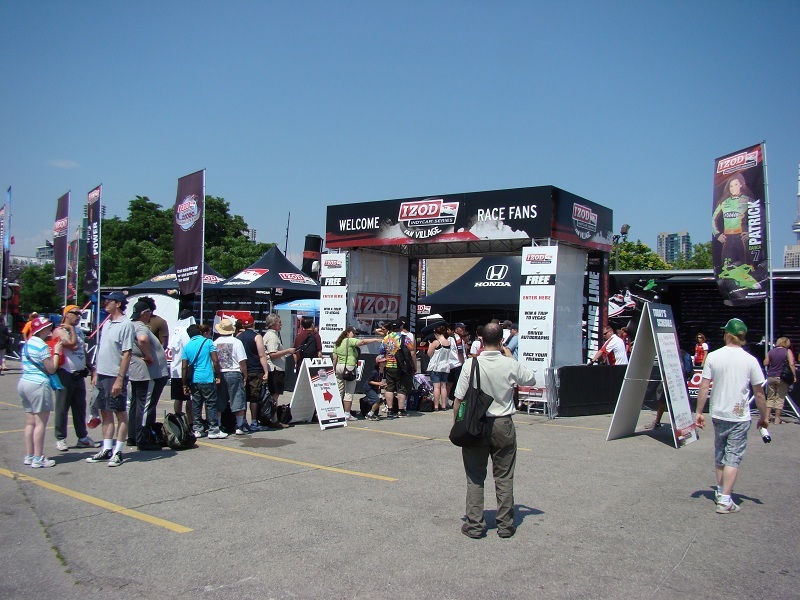 Much like the IZOD INDYCAR Series rolling down Gasoline Alley during the morning practice at Toronto, audiences appeared in droves to see cars and drivers up close belonging to Canada's premier stock car racing series. By the appearance of men, women and children hustled inside the Direct Energy Centre, it seems the Honda Indy is reigniting that magnetic race enthusiasm for auto racing in Toronto. Back on the 1.755-mile track, the Ferrari Challenge series opened up their Italian-built V-8 powerplants down the frontstretch. 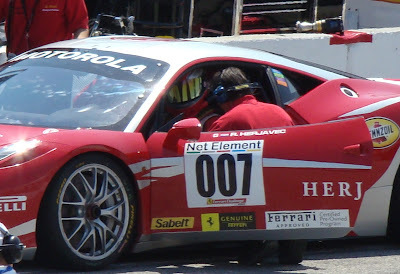 One of the drivers competing in the 2011 debut of the Ferrari Challenge at Toronto was popular businessman and TV Personality Robert Harjavec. After being out of almost every deal that came into the Canadian version of the business pitch show Dragon's Den, Harjavec was in fact 'in' control of a F420 Challenge car numbered #007. Notification of a massive autograph signing in the INDYCAR Fan Zone instantly lured the most anxious fans wanting to have the signature and a few seconds with their idols from the IZOD INDYCAR Series. While IZOD INDYCAR afternoon practice sent out exhaust notes of Honda V-8 engines, over a hundred individuals awaited patiently in the hot summer weather for an event still more than an hour away. Danica Patrick, James Hinchclffe, Paul Tracy and JR Hildebrand were among those seated at the head of fans greeting each admirer warmly. Bringing memories of when I waited in line for autographs from the 2001 Players Racing duo of Alex Tagliani and Patrick Carpentier, the wait can certainly be worth the time spent. I remembered on that day leaving the autograph session I inadvertently ended up in the way of Michael Andretti riding a scooter back to his race team's paddock. Unfortunately, I would not obtain my first digital camera until late in that year. Andretti and the #6 Newman/Haas Racing team went on to win the Toronto race with Alex Tagliani finishing just behind in 2nd place. I mused afterwards that if Michael Andretti would have accidentally ran into me he could have won the CART championship. In the next edition, for what will be my final chapter in this visit to the 2011 Honda Indy, I will conclude this tale with a revisit from the IZOD INDYCAR Series and the exciting qualifying of the NASCAR Canadian Tire Series.